If you are suffering with Diarrhea, take the juice of tomatoes which is made by tomatoes boiled in a cup of water and extract juice from it. To relieve from this problem make the habit of eating one or two fresh tomatoes first thing in the morning regularly. As it known that tomato is rich in Vitamin C, it helps in curing black heads. Rub the piece of tomato directly on the fresh skin, focusing specially on the area that is affected by black heads. This process helps not only curing blackheads also helps in removing dead cells and keeps face glowing and rejunavate the skin cells. Tomatoes as earlier said they are rich in Vitamin A which has the healing power of damaged skin. Slice the tomato in to small pieces and rub on scars that are caused by acne, as it contains vitamin A which prevents the production of sebum that causes acne. To get rid of dark circles, make a paste of 1 tsp tomato juice,1/2 tsp lemon juice, a pinch of turmeric powder and a pinch of gram flour, take the mixture and apply under eyes, wait for 10 minutes and then wash off. Regularly do this process and see the result of disappearing dark circles slowly. Take a tomato, peel it and soak for some time in buttermilk and then rub the pieces on effected skin. As it contains good levels of acids which reduce burning sensation and the soothing agents that are presented in tomato relieve from pain. If you have skin problems such as Eczema, sensitive skin and itching, take tomato juice regularly in the morning and you will notice the difference within short time. Tomatoes have the quality of curing injuries without getting infected, take the slice of fresh tomato and place on the effected area in order to cure the injury and the blisters resulting by wound. 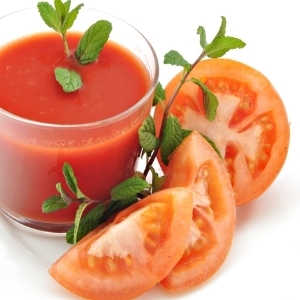 If you are suffering with mouth ulcers, gargle with tomato juice for 3-4 times a day. If Anemia is your problem, consume the mixture of Tomato and apple juice daily, as tomato is rich in iron it helps gets rid of anemia problem. Morning sickness is the common problem for pregnant women, to keep away this problem, daily drink the juice of tomato mixed with a pinch of salt and pepper powder early in the morning as it contains folic acid and iron it is considered best remedy for morning sickness. If you are obese this tip is for you, do you know that tomatoes gives only 20 calories form 100 grams? If your goal is to lose weight, then drink tomato juice daily, it contains less calories and makes to feel stomach full and also offers essential minerals and vitamins to the body that is needed daily. 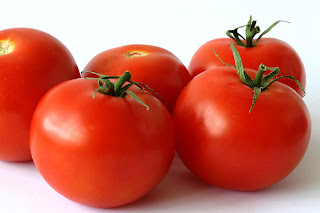 Tomato which helps in curing the above mentioned ingredients, also have the capability of curing several ailments such as Urinary Tract Infection, Night blindness, jaundice, liver disorders, Indigestion, constipation, intestinal disorders and diabetes. It is considered as natural antioxidant that helps to build immune system strong to flush out the toxins that are presented in the body. So regularly use tomato in your daily intake and keep all the ailments away.